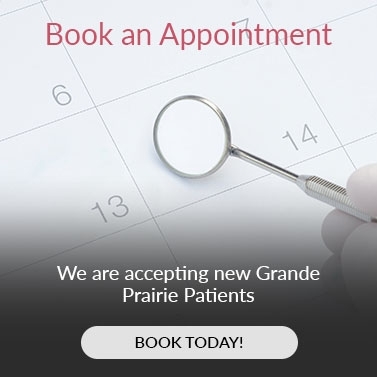 Prairie Mall Dental in Grande Prairie offers patients experiencing gum disease or gum sensitivity, preventative and restorative gum treatments. You may suffer from gum disease without ever noticing it. If you have tender or sensitive gums, use the information below to see if you have this problem before it escalates. Left unchecked, gum disease can cause bad breath, alter your bite and damage your teeth. To stop the problem from spreading, ask Prairie Mall Dental Clinic about gum treatments in Grande Prairie, AB and the nearby areas. Gums become diseased when tartar in the mouth leaks bacteria. This bacteria gets trapped in your mouth and irritates the soft tissues, like your gums. You can tell if you have developed gum disease because your gums will look red and swollen. They may even bleed when you brush or floss sensitive areas. Good dental hygiene habits, like brushing after every meal and flossing every day, can stop gum disease before it develops. Dentists also suggest that you update your toothbrush every six months and change brushes after a cold. However, if you’ve developed a more serious infection called periodontal disease, your dentist may refer you to a specialized periodontist. A specialist can treat you with oral surgery or a regenerative procedure if your gums have deteriorated down to the bone level. Take action and check your gum health today. Contact our team to book your dentist appointment.